The strongest ever catalogue combined with outstanding results from graduates on the track and a truly international buying bench propelled the Goffs UK Premier Yearling Sale at Doncaster to new heights today as last year’s record figures were comfortably surpassed. The sale achieved record figures across the board with the average growing 15% to top £50,000 while relentless demand over the two-days saw the clearance rate finish at a pleasing 88%. 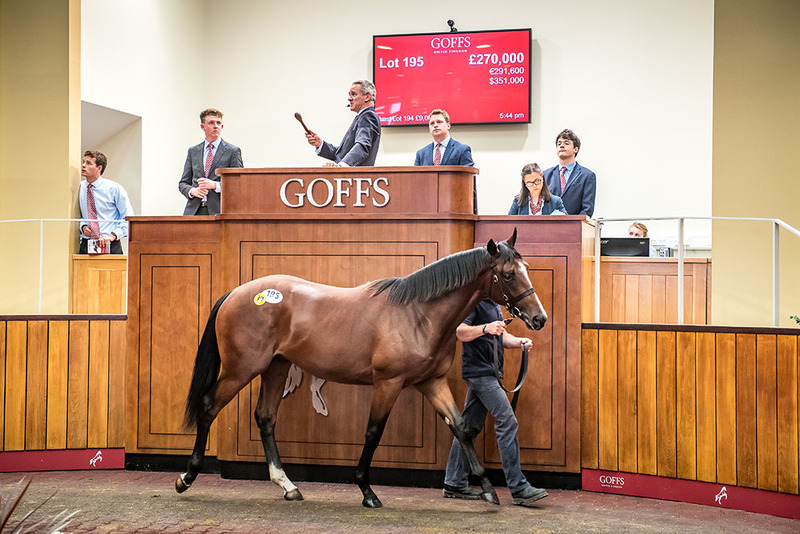 The top end of the market also showed significant growth with the number of six-figure horses climbing from 32 to 42 while the number of £200,000+ lots increased to ten. Yesterday’s top price of £270,000 (pictured) remained unbeaten with today’s session seeing Camas Park Stud’s Dark Angel colt (Lot 295) claim day two honours when selling to the Hong Kong Jockey Club for £250,000. The colt was one of five to sell for £200,000 or more today with Ger Lyons going to £210,000 to buy Norris Bloodstock’s Kodiac colt (Lot 304), Shadwell Estate paying £200,000 for Stratford Place Stud’s Dark Angel colt (Lot 327), Baroda and Colbinstown Studs’ Mukhadram half-sister to Beckford (Lot 355) selling to BBA Ireland for £200,000 and Farranamanagh House Stud’s Dark Angel colt (Lot 372) bought by Joe Foley for £200,000. “This was undoubtedly the strongest ever Premier Sale catalogue we have assembled, we marketed it globally in an effort to establish a world class buying bench and we achieved that with the sale now enjoying a truly international following. “The results this sale consistently achieve on the track gave everyone confidence going into the sale and the last two days have been simply phenomenal having produced marked increases in figures across the board following a record sale last year. To see the number of six-figure horses grow from 32 to 42 clearly demonstrates that this sale is very much competing for Europe’s best yearlings. “The growth achieved over the last six years has been significant and the demand for ‘Donny yearlings’ has never been higher following the exploits of horses like Barney Roy and Harry Angel to name just two. We are indebted to our vendors who have once again raised the bar with regards to the quality of yearlings they send to us and we wish our buyers, who descended on Doncaster from around the world, the very best of luck with their purchases.